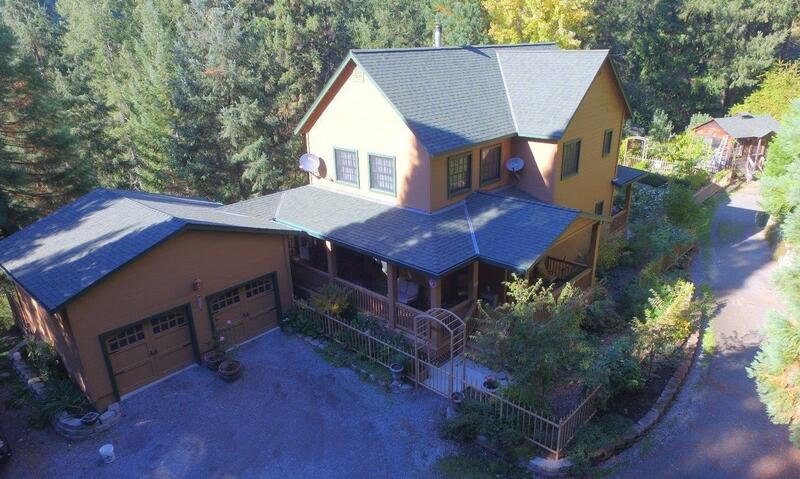 Stunning home on 60 acres of privacy. Gated private road for complete seclusion. 2 Year-round creeks with swimming holes. Great for gold panning. 2 Large ponds with fish. Breezeway 6 stall barn, paddocks, fencing. Bordering USFS with trails. Mature gardens, orchard & greenhouse! Quality built, 9 ft ceilings, marble and Brazilian wood flooring, granite slab kitchen island & counters, high end appliances and custom wood cabinetry throughout. 2nd story office area complete with library loft.